Note: Made another re-review of Tapu Lele-GX (#1 Card of 2017). Feel free to go back and read. Drampa makes the Pojo’s collective list at 11th place. There’s not much going on except for one attack: Dragon Wisdom. It’s single Colorless typing means it can be splashed into any dragon deck regardless of energy types. Not only it does 20 damage (which helps soften up damage for securing KOs), but you put a basic energy card from your discard pile to one of your dragon Pokémon. Even if Drampa would be Knocked Out eventually, it is worth a single prize, and you can safely bring your desired attacker in front. Even if it survives, its single retreat cost makes it easier to pay, and Escape Board makes it free to retreat, even if it’s asleep or paralyzed. It may not exactly be like Volcanion from Steam Siege, but attacks like those are worth another look, and even enough to make it on the list. Drampa (DRM 51) gets another version in the Dragon Majesty expansion set. This is the fourth version of Drampa, if you include the GX, and it has a decent set up attack in Dragon Wisdom that does only twenty damage but allows you to attach a Basic energy card from your discard pile to any one of your Dragon Pokemon. This could also potentially be attached to your active Drampa, which could then potentially use its second attack, Hyper Voice, for eighty damage on the next turn. More than likely, however, you’ll attach that energy to one of your Benched Pokemon that will do more damage. Dragon Wisdom isn’t bad, but we know that attaching from the discard is inconsistent in the early game and less than desirable later. Dragons do have Mysterious Treasure and Ultra Ball, however, so it’s not impossible to get Energy Cards in the discard pile early, and with the multiple energy type costs many of them have, any extra acceleration will probably help down the line. Drampa isn’t bad, if you don’t have a better early game set up Pokemon, Drampa’s energy acceleration can definitely help you later in the game. IMO I think there are probably better Pokemon to have in the active position on turns one and two, however, but Drampa can potentially help get your benched Dragons powered up. Drampa (Dragon Majesty 51/70) is our next runner-up. As a reminder, we’re looking at cards that didn’t make our final Top 5 for this mini-set but did make at least one individual reviewer’s personal top pick list, specifically being their highest rated card that did not also make the site’s Top 5. Clear as mud, right? I’ll try to keep the rest of this review clear and concise, mostly because I don’t have time to write a longer one today. Enjoy! Drampa’s niche is most likely an early game attacker. very early game; ideally you’ll have it in your initial hand and use it as your opening Active to start the game. 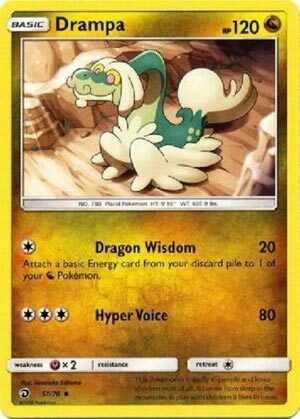 Due to cards like Mysterious Treasure and/or Ultra Ball, most decks should manage to get a basic Energy card into their discard pile so that you can use Drampa’s “Dragon Wisdom” attack to attach said Energy card to one of your Benched [N] Pokémon. You’ll also do 20 damage, just enough your opponent has to weigh whether or not Drampa is safe to ignore; one use of Dragon Wisdom only allows you to “break even” in terms of Energy on the field, as you had to invest one for Drampa to attack in the first place. The main advantage to Drampa being up front is Drampa is more likely to be KO’d than whatever you’re trying to build on the Bench. With 120, Drampa is still an easy OHKO once your opponent’s deck gets going, but that isn’t necessarily a bad thing. If your opponent KO’s Drampa, you can use a Lance [Prism Star] or Zinnia on the turn after. If your opponent ignores Drampa, either forcing it to your Bench while they attack something else OR just not KOing it, an Escape Board allows it to retreat for free and serve as a pivot Pokémon. For [CCC], Drampa can use “Hyper Voice” for 80 damage; not great but it doesn’t care about Energy Type specifics so if you’ve still got the Energy you attached in order to use Dragon Wisdom, you’re a Double Colorless Energy or Zinnia away from not-quite 2HKOing almost anything smaller than a Stage 1 Pokémon-GX. If you don’t have an Escape Board attached, Choice Band will bring all but the larger Stage 1 Pokémon-GX and all Stage 2 Pokémon-GX into 2HKO range… which still isn’t great, but it is far from useless, which is the point of a card such as Drampa. It isn’t supposed to be an okay opener and a great back-up attacker or a great opener and an okay backup attacker… it’s an okay opener and an okay backup attacker. If you need more than that, there are cards like Drampa-GX, which was a great opener and main attacker in its prime and is still reasonably good. For the Stanard Format, Drampa might be a worthwhile card to supplement something like Latias [Prism Star]; it is a 130 HP Basic that for [C] can do 30 damage while attaching a basic Energy to EACH of your Benched [N] Pokémon. As it is a Prism Star card, you’re only allowed one, so you’ve got the room and need for a backup option in case it is Prized or lost too soon. I said “might” because so far, it looks like both are too slow to bother with. Definitely seems too slow for Expanded, where you’ve still got generic tricks like Max Elixir or [N] specific options like Double Dragon Energy. Dragon Majesty wasn’t released as individual boosters or booster boxes, instead only being sold as part of things like gift sets; as such I don’t believe you can create a sanctioned Limited Format event with it (there were no Pre-releases for it). If you decide to do one anyway, here Drampa is pretty great; most of the set is [N] and its numbers are all much better when people have to play whatever they can pull from packs. Drampa’s a Basic Dragon Pokemon, 120 HP, with a Fairy Weakness, no Resistance, and a Retreat Cost of 1. Dragon Wisdom does 1-for-20 and attaches a basic Energy to a Dragon Pokemon from your discard pile while Hyper Voice is 3-for-80 vanilla. Needless to say, run it if you’ve got Dragons that can afford to have Drampa as set-up. He may not be ideal for early game damage, but setting up Energy on future attackers is pretty important, so do your best to work with him in mind. He can work with any Dragon deck thanks to his Colorless requirements, so in combination with other Dragon support, he’s in pretty good shape. Only major issues are the use of an attack and the 120 body, but that’s remediable in the face of having Energy on these guys. Arora Notealus: Drampa’s so easy-going, and what a great way to introduce a Normal/Dragon to us!